As the last post of the year, we thought it would be good to focus on a creating a more sustainable holiday. Every year, there is a debate about which is more environmentally friendly: artificial or natural Christmas trees. Regardless of what you chose this year, you can’t leave it up forever. 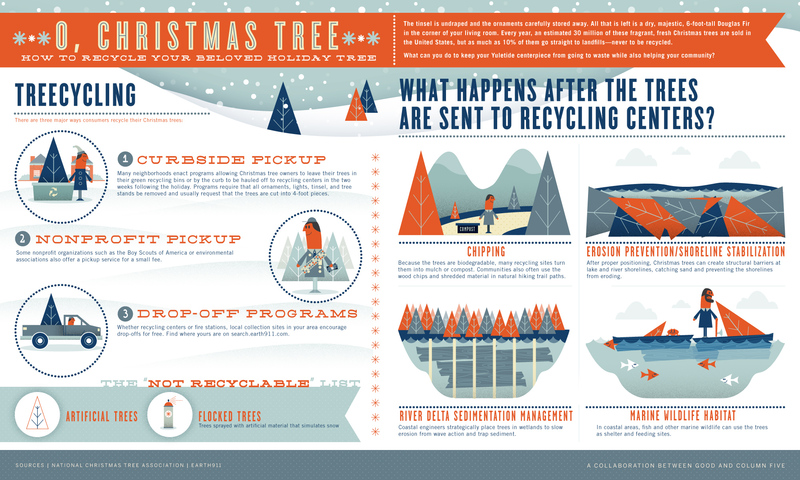 There are a number of ways you can dispose of your natural Christmas tree to reduce the environmental impact. Here is a great infographic from GOOD.is on some of those the ways. Click on the image below to visit the original post. So What is Vibrant NEO All About? Over the past week our website, Facebook and Twitter traffic has been steadily increasing. In light of this we thought it would be an opportune time to give a quick overview of our initiative. In terms of history, funding and organization you can visit our About pages. What we want to cover today is more of the soul of the initiative. NEOSCC is a regional coalition funded mainly through a HUD Sustainability Communities Grant to NOACA. It is made up of diverse members from across the 12-county area, including local and county governments, businesses, and organizations from the planning, transit, and higher education sectors. Vibrant NEO 2040’s goals are to design a framework to move us toward a more vibrant, sustainable and resilient future, and create a set of tools we can use to build that future. Vibrant NEO 2040 is practical – we believe we are more likely to succeed by pooling our efforts than by going it alone. Vibrant NEO 2040 will focus on finding genuine consensus, bringing all of us together on common ground. It will capture what is meaningful to the residents of Northeast Ohio to build a shared vision for our future. Vibrant NEO 2040 will create opportunities for real problem solving across jurisdictional boundaries and solutions will be built to fit local situations. There are no one-size-fits-all answers to these questions. Vibrant NEO 2040 will help Northeast Ohio secure the resources it needs by developing a clear vision and strategy linking our transportation needs to our new and existing job centers and workforce markets. We need the perspectives of as many Northeast Ohioans as possible to create a real picture of what our region’s future needs to look like. To see more about what NEOSCC and Vibrant NEO 2040 and why it’s so important to the future of our region, go to www.vibrantneo.org. We are excited to announce that Sasaki Associates has been selected to serve as the lead Planning Consultant for the Vibrant NEO 2040. 1. They are a world-class planning organization with substantial experience in Northeast Ohio. 2. They provide an integrated approach that allows them to handle all three consulting tasks. The Scenario Planning team will include the following consultants: Sasaki Associates, Inc., City Architecture:, Fregonese Associates, Nelson Nygaard along with previously retained Cleveland firm The Cobalt Group and Western Economic Services. The Efficient Government Network is a group of Northeast Ohio stakeholders, primarily from political subdivisions who convene, connect and share ideas and best practices for local government collaboration. Created in the fall of 2010, the Network grew out of the EfficientGovNow contest (supported by the Fund for Our Economic Future and Advance Northeast Ohio). This competition gave birth to innovative ideas – and action – that targeted collaboration and efficiency. The grant, formally submitted by the Sourcing Office on behalf of the EGNet, will be used to turn the informal network into a sustainable organization that will facilitate and promote the acceleration of shared services and government collaboration in Northeast Ohio. More than a dozen partners from the private and public sectors, including the Canton Regional Chamber of Commerce and the Youngstown-Warren Regional Chamber of Commerce, were involved in the grant application. You can read more about the grant in EfficientGovNetwork’s newsletter, here! The Northeast Ohio Sustainable Communities Consortium is only one of a number of Sustainable Communities grantees. Recently, the U.S. Department of Housing and Urban Development published profiles describing some of the work other recipients are doing. “Every now and then you’ve got to ask the hard questions. The one we choose to ask is: How will the Southeast Florida Region evolve over time to ensure that the development of the knowledge-based economy of the 21st century provides opportunity for the inclusive participation of all of the region’s residents?” – Dr. Mark B. Rosenberg, President, Florida International University. Flint, MI is using a HUD Community Challenge grant to complete its first master plan since 1960, charting a new course for the community’s future. Equipped with a Regional Planning Grant, the Metropolitan Area Planning Council is implementing their groundbreaking blueprint for regional reinvestment in the cities, towns, and suburbs of Metropolitan Boston. At the northernmost tip of Maine, the Counties of Washington and Aroostook are coming together to chart a course for mutual economic success with an integrated plan that addresses housing, transportation, water infrastructure, environmental planning, as well as economic opportunity and workforce development. “Imagine a riverfront destination that you can easily walk to, bike to, and take public transportation to – and you can easily envision a place that sustains and attracts new residents and businesses.”- Pittsburgh Mayor Ravenstahl. The Allegheny Riverfront Green Boulevard Planning project, funded by HUD Sustainable Community and DOT TIGER grants, will help convert a six-mile freight line into a green riverfront rail and trail corridor extending from downtown Pittsburgh to the city’s eastern edge. A new hub of innovation is brewing in the Heartland, where Greater Kansas City is knitting together its neighborhoods and localities to implement sustained and coordinated economic growth. HUD’s Sustainable Communities Initiative is assisting several communities within Washington State, including the fast-growing Puget Sound region and the Spokane Tribe of Indians. The James Campbell Corridor in Columbia, TN, has attracted $7.5 million in new investment since Columbia was awarded its Sustainable Communities grant. Click to visit the original article at HUD.gov. Local Food Systems is a project of the Agroecosystems Management Program of The Ohio State University, Ohio Agricultural Research and Development Center and many collaborators in Ohio, Michigan and Pennsylvania. Site development has been supported by a USDA Specialty Crops Research Initiative Regional Partnerships for Innovation Grant (posted here) as well as a structural change grant from the Fund for Our Economic Future in Northeast Ohio (information here). Local Food Systems strives to promote strong local and regional economies by offering tools that help entrepreneurs build business ecosystems rooted in agriculture. Entrepreneurs can use the tools on the Local Food Systems website to connect their business idea into a supply chain network of locally owned businesses, existing and planned, and together with other entrepreneurs and locally owned businesses find the capital needed to launch their businesses. Food is of particular interest both to entrepreneurs and consumers, hence the name localfoodsystems.org, but other basic needs like energy, equipment, services and materials that are part of agriculture are of equal importance. Our growing community of entrepreneurs, producers and consumers can create strong local economies by creating new locally owned businesses and jobs. Vibrant local and regional agriculture generates wealth in communities, establishes healthy environments for families, and enhances quality of life for all. You can visit the Local Food Systems website by clicking here! A black-capped chickadee, recorded on iNaturalist near Blake Road in Guilford Township (Medina County) on Sunday, December 2, 2012.
iNaturalist (http://www.inaturalist.org/) is a smartphone and web-based data gathering program designed to provide an ecological learning and teaching platform for amateur and professional naturalists alike. The world is full of naturalists and many hikers, hunters, birders, and beachcombers record their observations of the environment around them. If the record of observations is comprehensive enough, it may be possible for scientists and land managers to monitor changes in biodiversity, and allow anyone to use the comprehensive record of life to learn more about nature. A comprehensive record of nature is the primary purpose of iNaturalist. According to its website, iNaturalist began as the Master’s final project of Nate Agrin, Jessica Kline, and Ken-ichi Ueda at the University of California-Berkeley’s School of Information in 2008. Nate and Ken-ichi continued working on the site, along with Sean McGregor, post-graduation. Currently, Ken-ichi Ueda maintains the site in collaboration with Scott Loarie, a climate change researcher at the Carnegie Institution. A presentation about iNaturalist headlined the most recent meeting of the Lake Erie Allegheny Partnership (LEAP) at the Cleveland Museum of Natural History on November 14. Naturalist Marlo Perdicas, of Metro Parks Serving Summit County, introduced iNaturalist as an innovative tool for data sharing, citizen science, and learning. Perdicas illustrated the potential for iNaturalist as a means to vastly expand natural survey capabilities while fostering a stronger sense of community among iNaturalist users and park staff. She provided examples of how the program is currently utilized in Northeast Ohio, particularly Summit County, and also explored potential for expanded use through an energetic and interactive discussion with the audience.